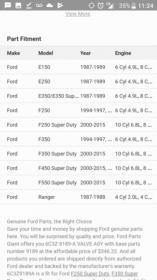 Diesel Forum - TheDieselStop.com > Ford Diesels > Power Strokes 1994-1997 General > Fuel selector valve failed again? Fuel selector valve failed again? I put in a new oem tank selector valve and it worked fine for a couple months as far as switching tanks and gauge worked fine. Before the replacement it was stuck on front tank and reading full all the time (past full) the same symptoms have returned. Any ideas? The truck is a 1997 7.3 diesel with about 500k on it. I checked the tank selector switch at the dash and it switches continuity between the two terminals above and below the power feed wire. I cleaned the connections at the rear tank sending connection, cleaned connection at switching valve and another one along the driver side fuel line / wiring run and the the two connectors on the drivers side engine compartments wheel well close to the second fuse box. Checked all fuses for continuity / voltage on both sides of fuse on both boxes. Curiously enough it seemed to break the second time at the same time the fuse for the a/c blew and neither has worked since. I have pored over many forum results and would be very grateful for any assistance. OK, responding to my own post. Upon further research at the oilburners site. I found that 3 month fsv failures are not uncommon with oem and aftermarket valves. The general consensus is that this repeated failure or possibly the original failure stems from broken particles of the plastic tank pickup nozzle itself deteriorating. (its described as kind of a shower head looking thing) or other debris in the tank making its way into the mechanical workings of the valve. Really had a hard time believing an oem fsv (fuel selection valve) that lasted 500k miles the first time would croak out so soon but it happened. Also the a/c is on the same circuit and has been reported to work again once the faulty valve has been unplugged. An in line strainer would be a great idea but seems like a bit of work. The valve can be found in many different ford vehicles between 1988-1998 which is great for the junkyard acquisition potential. When the valve switches between tanks the connection for the fuel gauge is only accomplished with a full switch from a functional fuel selector valve so a bad valve will lead to a non read sensor. Thanks for the help and hope this helps someone. I will report back if anything changes. Many thanks for that report, Cryghton23! I haven't had any selector valve problem yet nor have I had to drop my tanks. But if / when I do, I think I will eliminate the plastic showerheads in the tanks and leave the pickup hoses either bare or perhaps with a coarse metal pickup screen device on them. Then, I would endeavor to plumb in-line filters between the tanks and the selector valve that can be replaced without dropping the tanks. It does make sense that the selector valves are quite vulnerable to any debris they might encounter. The factory's answer to this was the showerheads which, ironically, too often have been found to be the source of the debris once they become old and brittle. Last edited by MichaelPatrick; 06-24-2017 at 12:09 PM. If you leave the pick-up foot(shower head looking thing) off then the sending unit will not be able to pick up the last 3rd of tank. Thus once it gets below half a tank you better switch tanks or find a fuel station. That's true. I would put hose extensions in place of the shower heads and make sure they are long enough to pick up fuel at or very near the bottom of the tanks. Otherwise, too much fuel would be left unused and unusable in the tank. they are not terribly expensive and they to act as a layer of protection. OEM showerheads are available on Amazon for $34-ish. Our originals have by now lasted 20+ years, immersed in fuel that was not nearly as stable as what is being dispensed today. And since most of us are not first owners, we have no idea where POs might have sourced there fuel. I'm sure if you're careful about where you source your fuel, a replacement will last at least the 20+ years the original did, most likely a fair bit longer. Update : a "new" used fsv from the junkyard brought all fuel functions back online ( it was out of a 1993 diesel approximately.) Ford dealer swapped out the broken fsv for new under warranty. Turns out the a/c needed a recharge which I just did off an ac/pro 20 Oz at home. I was shocked when I looked at the receipt for the fsv and found I had paid $511 before tax. I drew the oil out of the high pressure oil reservoir even after reading many folks speaking against the advice of the might Bill Hewitt and I must say it was a complete waste of time. Nothing sludgy or different about the oil in there. So +1 for leaving that part out of one's maintenance routine. We shall see if that makes any difference with smokey starts and what not but with few miles I have driven it seems some positive results are coming from the archoil. You'll have a great independence day and thanks for the help.